you’ve driven by this place 1000 times, but maybe you haven’t noticed it. or maybe, like myself, you have always wanted to go inside but tend to show up when it’s closed. well, today i stepped into the magical store. wow! it is truly incredible. 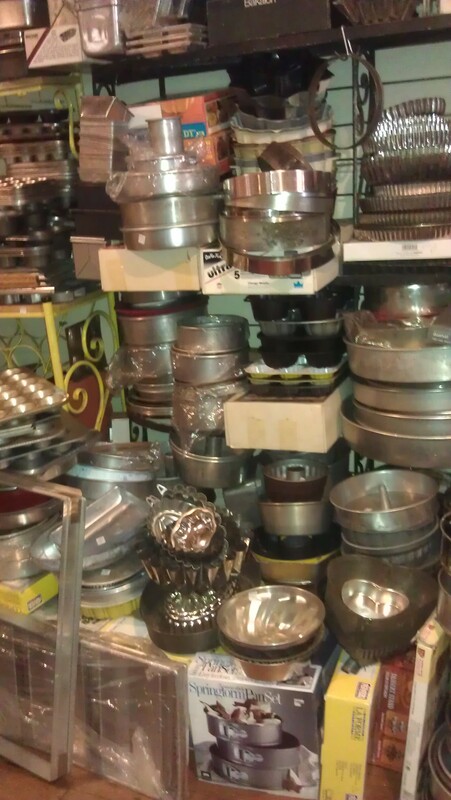 like a dream...a wall of baking tins! the store is packed literally floor-to-ceiling with anything you could ever want in your kitchen. i mean, really, ANYTHING YOU COULD EVER WANT. which actually translates to: this store sells everything i have ever dreamed of having in my kitchen. sigh. in a great effort of self-control, i walked away with only 3 things – a rolling pin, a pie tin, and a surprise for cole. sigh, again. in short, cookin’ on divisadero between oak and page streets is a wonderland of kitchen-y goodness. and if you can stop by during their bizarre hours of operation, please do. i highly recommend it!